In Java Class , We can add user defined method. Method is equivalent to Functions in C/C++ Programming. return_type is nothing but the value to be returned to an calling method. 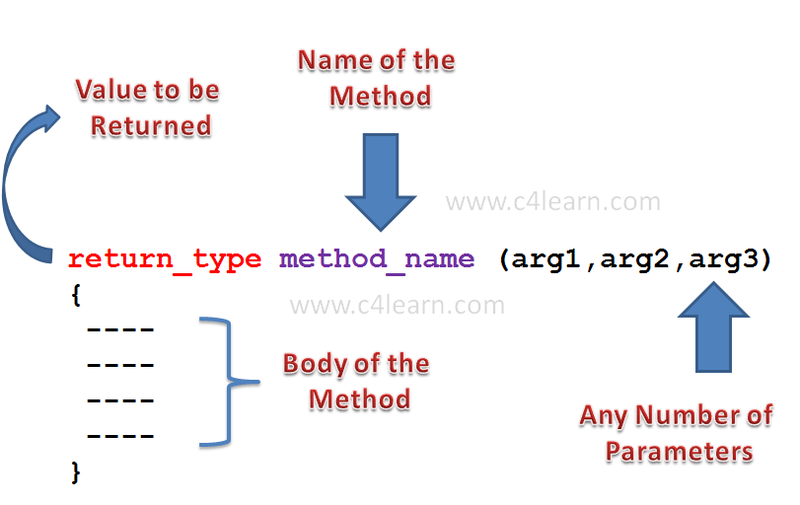 method_name is an name of method that we are going to call through any method. arg1,arg2,arg3 are the different parameters that we are going to pass to a method. Method can return any type of value. Method can return Object of Class Type. Method sometimes may not return value. Method name must be valid identifier. All Variable naming rules are applicable for writing Method Name. Method can accept any number of parameters. 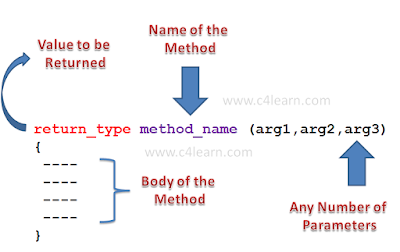 Method can accept any data type as parameter. Method can accept no Parameter. “r1” is an Object of Type Rectangle. Function call is always followed by Semicolon. Method Definition contain the actual body of the method. Method can take parameters and can return a value.